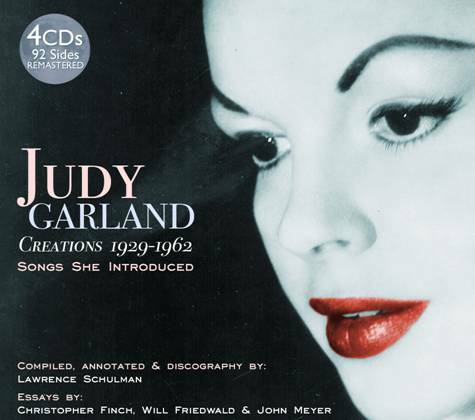 LONDON, August 9 — JSP Records will issue in the U.K. in early 2013 a 4-CD box set of entirely remastered Judy Garland recordings titled CREATIONS 1929-1962 – SONGS SHE INTRODUCED, which will contain 92 tracks and over 5 hours of music. The goal of the release is to include songs Judy Garland was the first to perform. Lawrence Schulman, who was behind such other Garland sets as Child of Hollywood (RPCD, 1993), Judy Garland at the Paris Olympia (Europe 1, 1994), Classiques et inédits (Frémeaux & Associés, 2008), Lost Tracks (JSP, 2010), Smilin’ Through (JSP, 2011), and The Carnegie Hall Concert (JSP, 2012) will compile, annotate, and provide the discography and many rare photos for the set. Christopher Finch (author of Rainbow: The Stormy Life of Judy Garland; The Art of Walt Disney: From Mickey Mouse to the Magic Kingdoms, and Beyond; and Chuck Close: Life), Will Friedwald (author of A Biographical Guide to the Great Jazz and Pop Singers; Stardust Melodies; and Sinatra! The Song Is You: A Singer’s Art), and John Meyer (author of Heartbreaker; and Operation Ruby Slipper) will contribute essays to the brochures. Peter Rynston of Tall Order Mastering will be in charge of audio restoration and Andrew Aitken the graphic design. John Stedman, head of JSP Records, will produce. it’ll be nice to have all these tracks on one cd set.